The ghosts that remain beyond the devastation of war and the efforts of revival. A cryptic and dreamy vision is shown in House of Others by the Georgian new talent Rusudan Glurjidze. The conflict of the 90’s in the Abkhazia region leaves many empty houses, once inhabited by the defeated side. Here is where the winners are setting, within some agreements held by shady authorities, yet soaked with the corruption and criminality of the war that just ended. In this part of nature; calm and pervaded by a strange fog, a family arrives to live in their new home. They appropriate objects, furniture, clothes and living spaces which breathe another existence. Their neighbours are three remarkable women: two sisters and a teenage daughter. Rusudan Glurjidze moves in her characters’ states of minds and presents us with defeated, fragile and lost souls that exist in a world that they seem to cross, yet never live. Rusudan Glurjidze was born in Georgia, Tbilisi. 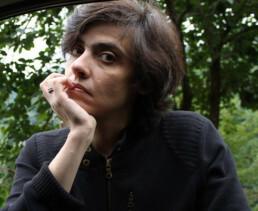 She graduated from French Language & Literature at the Tbilisi State University. From 1990 to 1996 she has been studying Film Directing and Scriptwriting at Georgiy Shengelaias’ class at the Georgian State Film & Theatre Institute. After dissolution of the Soviet Union that destroyed Georgian film industry she worked at Advertising and National TV, shot numerous musical and commercial clips. Since 2007 she have been working as a producer and art director of “Cinetech film Production Company”. Rusudan is a founder of Summer school program. 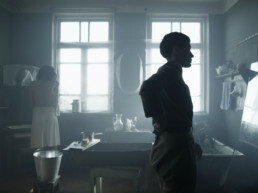 Her feature debut project HOUSE OF OTHERS was chosen among 10 European projects selected by B’EST (The Baltic Bridge East by West) organized by EAVE and MEDIA Mundus, was finalist of Open Doors Locarno IFF 2013 and awarded at CineLink Sarajevo IFF 2013. HOUSE OF OTHERS is her directorial feature debut.